The Magestic Bald Eagle Takes a Bath! The mosquitoes were out and the electric blue wild violets were in bloom. The river is moving fast and the water level is moving up. Over the past two weeks, I’ve been taking photographs at a single spot along the shore and will use those over the coming days for comparison. A series of four…check out the fourth slide. It makes me laugh so hard. I consider it an honour to be able to spend so much time observing unlikely magic at the river. I don’t take any of it for granted. I’ll find a piece of music to play while the slide show runs. The past three days, we have been pulled out of the deep freeze and into a melt. I can not walk through the tall woods at the river, without hearing the constant mating thrums of Northern Flickers and without seeing the wild flurry as males, out of urge and instinct, chase the females, dodging in and out of branches. I can hear the echoing drum of the Pileated Woodpecker on the opposite side of the river and thrill to see my Alberta Birders’ archives of the splendid colour, later, on my computer at home. It is as though everything has come to life, suddenly. For so long, the world slept. It all began with the Magpies. 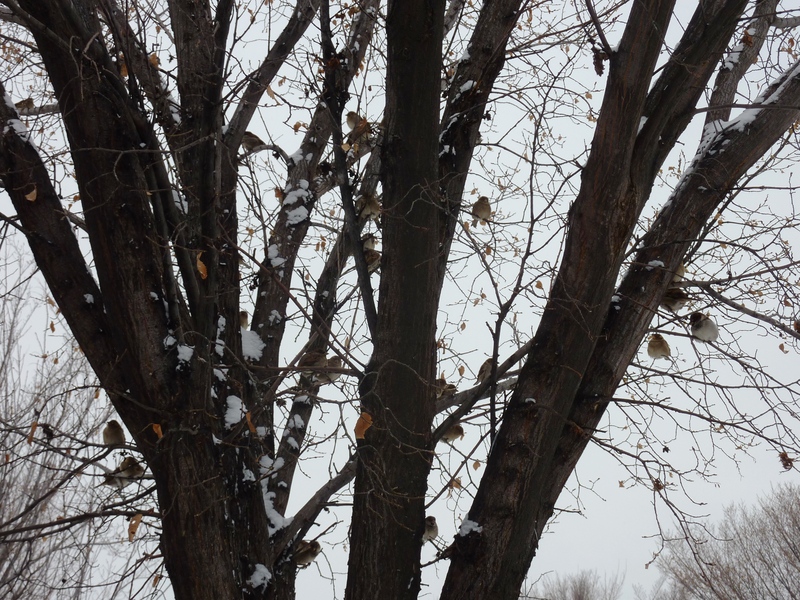 My neighbourhood, even as snow mounted on our quiet circle, was abuzz with the squawking gathering of dead branches that were tightly woven into the growing bulb of nests, peppering the remaining Elms. Evenings, I stood in contemplation while the adult Bald Eagles, flew west and east and west and east, gathering up lining materials and tall grasses, returning again and again to the nest that was clearly visible all winter long. The juveniles have mostly disappeared, leaving the two regal raptors to forge out a life for the new. It has been an intimate and powerful encounter to watch these families throughout such a harsh winter. While these aren’t the best of shots, I have a wee archive of the interesting approach to gathering. I can only imagine living in one of the ‘big’ houses along the ridge and having access, every day, to such wonder, just outside my windows. Whether one enjoys the nesting behaviours of an eagle, or the simplicity of sparrows that nest in a stove vent…it is all so amazing. As my children have become adults, I have experienced a sense of loss. Some days my heart feels empty. But, then I step out into nature and I observe what surrounds and once again, my heart sings. I am reminded that God made all of this for me. I am reminded that I need to take responsibility for such astounding beauty. Sometimes it can all be very brutal, but at other times, it is pure fragility and tenderness. OH! To have had an audio tape! I used to make my own tapes. I read aloud late at night, staying slightly ahead of the students. Dandelion Wine is my favourite book. Take a listen, if you have 9 hours to spend, just sitting still, or while you’re working in your studio, just listen. You will learn to take pause, if you let this book’s lessons sink through the tough shell that has become your busy life and settle on your heart. This post is about Chapter 21 and Douglas’s loss of his dear friend, John Huff. I guess if you are the daughter of a military man, this might even mean more. Taking your time and noticing is what this post is all about. As one pours on the years, one realizes that in order to slow things down, one needs to start noticing. I was hot and sweaty and cleaning out the paint buckets that I had used with grade ones, painting that day, when I heard my cell phone ding. My friend, Michael, had sent a text that he’d like to drop by. I thought immediately that we might go to the pond, with Max, and enjoy what was left of the beautiful day. I rushed, swirling the pink water out of brushes and buckets, returned my tools to the storage closet and was out and on my way. Mike was sitting on the steps when I arrived and Max’s nose was lifted, sniffing against the window. A quick change into play clothes and we were off to the pond! Michael patiently observed the life and light of the water, the clouds and the life surrounding this special place. It was so nice to have a witness to Frank’s Flats and the place that I know so well. Michael is always taking amazing photographs, but rarely appears in any of them. I like that he looks out at the world! No selfies for this guy! So, on this outing, I would be witness to his life! We enjoyed the explorations of baby coots. I took my photo of the bush. And then we were on our way for the next adventure. Some time ago, I had seen one remarkable photograph on Michael’s social media archive. He told me that it was taken at McKinnon’s Flats. I asked if ever he went back, would I be able to join him? This was the day. Here’s the photograph that inspired the request! I didn’t stay left on 22X and so we ended up going north on Stoney Trail. That was okay! Meant to be! We began our slow enjoyable zig zag across the rural landscape, making our way, with ease, back south to McKinnon’s Flats. I saw a bird I had never seen! And the light and wonder of it all was very enjoyable. Michael’s photograph….from this location…truly captured the magic! The panorama view that opened up as we began our descent into the valley, at river’s edge, was spectacular. Next time, I will document that. It took my breath away. Once at the river’s edge, Michael pulled out our picnic food. A refreshing potato salad filled with the flavours of fresh veg and lovely dressing…and an icy cold hibiscus drink, so refreshing! Max observed, but was hungry to be free of his leash and to explore the water’s edge. It wasn’t long until I did just that. The stretch of walk we took, saw zillions of little moths lighting up the already-electric air. We chatted about photography and light and the sky the entire way. Out of nowhere about 75 striking white pelicans, hung on the air just above our heads. I grabbed my camera and snapped this wee instant as a documentation of the memory, that in no way, captures the intensity of the moment. We decided, standing still above the river, that this moment was meant just for the two of us…two good friends enjoying evening light. In order to really gather up my life, I need to do this. Slow down. Watch light. Treasure friendship, my children, my family. Listen to music. Make art. Write. I am grateful for the inspired invitation to go for a Sunday drive on Friday. Everything that I had planned for the evening, went out the window. And it was exactly as it should be. My life is a blessed life. I ponder this while looking. Snow on hills for miles. Ice packs moving on the dark water.